Discovering Rome by bike is practical, stimulating, and let’s you explore the city on a deeper level. As one of the most visited destinations in the world, the centre of the Eternal City is surprisingly compact. As such, exploring beautiful sites and indulging in delicious grub is made easier through its intimate layout. While the concentration of its historical gems is great for the pedestrian pioneer, sometimes a sore back and a ticking clock can diminish the experience. Whether it’s your first time in Rome, or you’re looking for a way to jazz up a favourite holiday, read on to get some answers. Rome by bike, or a take a hike? Strapping on a helmet and discovering rome by bike not only propels you into the heart of Roman culture, but is an effective use of time. Furthermore, if you’re zipping through the city for a quick weekend get-away, then sitting astride a sweet set of wheels allows you to visit Rome’s green spaces, too. Rome’s parks are more than pockets of fresh air from the chaos of downtown traffic. They’re also home to architectural masterpieces, the likes of which belonged to Rome’s influential noble families. As one of the largest parks in Rome, Villa Doria Pamphili is an idyllic setting for recreational cycling. Visitors have nine kilometres of greenery at their disposal to explore, and can also admire the Villa Algardi, a 17th century palatial building on the grounds of the park. Some of the structures in these sprawling villas are open to the general public in the form of museums. In fact, the famed Galleria Borghese, in the sumptuous Villa Borghese park, is a stimulating destination for art and sculpture lovers. One of the city’s advantages is that many of its most popular monuments are walking distance to one another. Weaving through other tour groups can slow an itinerary down, especially in the high season of the summer months. Additionally, extensive walking, no matter how leisurely, can increase the risk of physical discomfort. Hitting concrete for hours at a time, even in comfy shoes, can cause back ache, blisters, dehydration, and general crankiness. Therefore, cycling is an excellent way to optimise the time available, and be kind to your body. The change from heels to wheels will also add variety to your schedule, and keep things interesting. With a bike, arriving on time to various tours will be a breeze. You’ll feel rested from any previous excursions, and therefore ready for other stimulating opportunities that the city holds. Ready to start peddling? Then check out the bike tours hosted by the expert guides at A Friend in Rome. They’ll keep your needs in mind when picking the right itinerary, ensuring your cruising comfort. Are you a gym fanatic ready to tackle the city head on? Or are you seeking something more leisurely with the family? Regardless of your fitness level or goals, A Friend in Rome will create a bike tour that works for you. For any first time visitors, getting to know the city before cycling through it can be daunting. However, wandering the city after sundown provides a scenic and informative solution. Major monuments and streets become relatively empty after the bustle of eager tourists, allowing a golden opportunity to soak in the city’s offerings without the stress of overcrowding. Mind the Guide’s Rome by Night Walking Tour and Trastevere is the chance for relaxed exploration with insider knowledge. Once you discover some of the city’s secrets, you’ll be able to hop on your bikes, and peddle to glory. Who knows? You could also cycle to other Mind the Guide tours, and go even deeper in your understanding of this eternally intriguing city. Underground Rome. The sites you cannot miss! Visiting Rome is amazing but you can’t cover in just one trip all the wonderful things the eternal city offers! To avoid frustration arising from missing the important things, we have created a quick guide to the roman underground – places you can’t miss when in Rome. Here we introduce you to the buried secrets that makes Rome unique. Probably the only competitor of the Colosseum, the Baths of Caracalla are the best preserved baths of the ancient Rome, a real window on the ancient roman daily life. Health, sport, culture where considered important by the romans and the baths were the places of such activities. Under the Bath, thousands of slaves worked in narrow roads, litting the fire, heating the upper pools where roman citizens spent the day. Simply amazing, this underground section is rarely accessible, and hopefully it will be opened to the public with a regular time in summer 2016. Before the execution, Saint Peter was detained in a prison that stands next to the Roman Forum: it is called Carcere Mamertino and consists of 2 scary rooms under the ground where people were kept before the punishment. Life imprisonment was unknown in the past, and criminals were imprisoned just for a short time, waiting the seasonal games of the Colosseum to be executed in front of the mob. For 3€, you are taken in this underground rooms, one on the other where thieves and slaves waited their fatal end, planned by a cruel justice. This place is probably the most beautiful among the many underground sites of Rome: an ancient apartment with frescoed rooms and mosaics, with a private bath, all under the church of John and Paul on the hill Celio, 5 minutes walking distance from the Colosseum. The story of a Martyrdom, happened in these rooms, transformed the place in a devotional site for the Holy See: altars and inscriptions dedicated to martyrs are everywhere in this little catacomb. Opened everyday, except Monday and Tuesday, it’s a must see when in Rome! You don’t need to book, it is open from 10am to 1pm and from 3pm to 6pm with a ticket of 8€ (6€ if you have already been at the Colosseum and you show the ticket). Saint Callist Catacombs are also recommended: the advantage is that they are open also on Sundays while Saint Sebastian ones are closed. Both the Catacombs are along the Appian road: 1 hour walking distance from the Colosseum (not recommended to walk until there). Take a Taxi at the Colosseum: the ride is about 15€. Also the Bus 118 arrives at the Catacombs of both Callist and Sebastian; same bus will take you back. A little secret place, called Vicus Caprarius, is the only chance for you to see an original roman acqueduct. An underground cistern that worked to provide the city with drinkable water and satisfy the needs of the population. The same acqueduct is filling the above Trevi Fountain’s cascade of water. In the excavation is conserved a little treasure, an amphora with hundreds of coins, that was found here: probably somebody concealed his saving during the legendary sack of Rome in 410 AD. From 11AM to 5.30PM is opened everyday, except on Monday, at the cost of 3,5€. Address is Vicolo del Puttarello, 25. Rome: where for lunch and dinner on Christmas time? Christmas is certainly the number one festivity in Italy and, of course the one with the highest attraction, and it brings a huge slow down in terms of public life. Family first of all! So lots of shops and museums are absolutely closed. Christmas dinner is very intimate, let’s say, for the real family.On the 25th, the so called Pranzo di Natale (Christmas Lunch) is dedicated to the large family, (including those relatives that you don’t get along with) and that, thank God, you get to see only on this occasion! New Year’s Eve works similar to Christmas, but many restaurants are open and organise the famous last dinner of the year, the Veglione (Ball in english). Unless one of these families is opening their doors to you, what will you do? And where will you go for Christmas in Rome? Here is a list of places you can go and be served a delicious treat while romans are busy with celebrations. I love this place for the food and wine. It serves traditonal roman cuisine, selected wines and it is modestly priced. All their products are from Rome’s outskirts and their selection of cheeses and hams can do for a delicious appetizer. Red wine suggested? Cecubo or any Cesanese based wine. Strictly central (just 5 minutes from Spanish Steps) is open at lunch on the 24th and the 25th. Give a call to book a table! Recently opened, is a wide and multifunctional place with an excellent cuisine offering italian food, pizza and a large selection of artisanal beers. It will be open on Christams day for lunch (Menu 50€, 25€ Child) and on the 31st for dinner from 9.30pm (same price for the New year’s Eve). This place is excellent for Pizza and is easy to find (10 minutes walking from the Stop Piramide, Subway B-line). Not touristy at all ! Give a call to reserve a table. Open everyday (closed on 24th and 1st January). Located at the beginning of Via dei Fori Imperiali, next to the Column of the Emperor Trajan, there is this small restaurant serving local food and wine. Sitting at the table you can see the imperial ruines in a charming context while drinking an excellent wine and eating local roman cuisine. They will be open for the 31st dinner and it is an occasion to stay in the center having a magical dining experience. Reservation is mandatory. This restaurant is close to the vatican museum and is ran by Stefano and Francesco. I have seen the menu on their home page and is absolutely mouth watering. Their artichokes, tortellini, ragù, pasta, hand-made panettone and gelato will enhance the Christams lunch (85€); wines and Prosecco are included. On the 25th (lunch) and 31st (dinner) of December the menus are vamped up with raw fish, pasta, oysters and champagne. Next to the a-line subway stop Cipro. Make sure you book a table. What about if I am preparing dinner by myself? First I want you to know that if I was not going to my Mom’s, I was going to be joining you; I love to cook but my Mom doesn’t let any living beings in the kitchen for hours! So read the list of Markets where you can shop with the locals. This market is located next to the Circus Maximus and is open every weekend but closes during the Christmas period to the Epiphany. It has an extraordinary opening on the morning of December 23rd. Here you can find several producers of fresh food who carry their products straight from their farms to the center of Rome. Organic, mile Zero, this market is a fresh breeze of genuine food in the center of the touristic area of Rome. Testaccio market is probably the trendiest market in Rome and it is open on 24th A.M.and 31st A.M. Recently re-opened is frequented by the hipsters of testaccio and has a nice finger food area over the normal shopping area with stands of fish, fruit, bread and vegetables. It is the right place if you like to eat something while out, roaming in the city: visit the roman style sandwiches of Picchiapo or taste a deliciuos sicilian cannoli at Dess’art. Be ready to the surprise this place provides: ugly outside, chaotic and stuck in the past, this market is how markets used to be 50 years ago. From the central Piazza Venezia, the tram number 8 will take you in the working class district of Monteverde: within 15 minutes you will be catapulted into another Rome. Kiosks, owners screaming, old ladies peeling cicory, the fish on the bank (fresh and supreme). Don’t miss the stand called Tuttoghiotto, where Riccardo will amaze you with a delicious tasting of cheeses and hams from all around Italy: the ancient roman cheese (you can find it only here!) is a true gastronomic experience. Gelato. It’s the one Italian word I made sure I knew how to pronounce properly before my first visit to Rome. When I arrived I chucked my suitcase in my hotel room and then ran out the door like madwoman looking for the first gelato sign I could find–I was that serious about gelato. Lactose free gelato, Giolitti. (Image by Diedré Blake). Click to visit her site. If you’re like me, then planning your trip to Rome (or while you are here) you’ve been looking into where you can get the best gelato. Well, I have no answer for that, because it’s mostly all good to me. But if you’ve been searching on TripAdvisor, then the name Giolitti should already be familiar. Wondering what to eat on your next break between seeing Rome’s most famous sites? Well, the Eternal City has many quick and easy treats to refresh you before you begin your journey again…and no, we don’t mean gelato! Image by Just A Taste: http://www.justataste.com Not in Rome? Click the image for an a recipe! 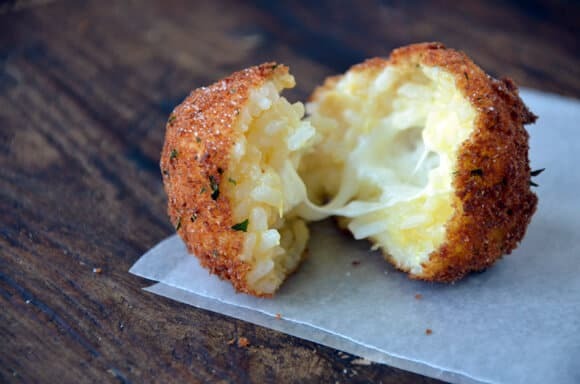 Arancini – Melted mozzarella, ragù (meat sauce), tomato sauce and peas are the usual fillings of this large-sized fried rice ball, a satisfying and easy to eat Sicilian treat. Last fall, we featured one of our tour locations as a blog post: the Baths of Caracalla. Perhaps not has popular as the Colosseum, Roman Forum or Vatican, the Baths of Caracalla remains a monumental and awe-inspiring structure. As we draw closer to the warmer spring weather, Mind the Guide invites you to take a look at our Rome tours, especially the Colosseum ad Baths of Caracalla Tour as well as the Underground Colosseum Tour. With this weather, there is one site that you should visit while you have the chance: The Baths of Caracalla (Le Terme di Caracalla). January 27th marks the date of the International Holocaust Remembrance Day, which was established by a UN General Assembly resolution on November 1, 2005. The International Holocaust Remembrance Day is grim reminder of the past atrocities of genocide and mass killings, but also serves as a warning for the present and the future. In Rome, on October 16, 1943, 1259 people were deported to Auschwitz from the Jewish Ghetto…only 16 of them returned. Nazi round of the Jewish Ghetto. Image from L’Italo-Americano. Click to visit their site. Click per la versione italiana. Il Mercatino Giapponese in Rome: Should You Go? We'll Let You Know. Testaccio Market. Image by myVideoMedia. Click image to visit their blog. With each successive generation, there is a perceptible shift and perhaps distortion from the classic understanding of tourism. Until a few decades ago, traveling meant settling on one major destination with all its bells and whistles. This was, for a variety of reasons, in contrast to the prevalence of today’s do-it-yourself planning and the popularization of backpacking to contain costs and expand options for where to go and how much to see. Copyright 2019 Mind The Guide S.r.l.